We have been such a busy little family lately. My son just celebrated his 14th birthday (how can this be?). His grade 8 graduation is coming up. My daughter has her dance recital this week (two nights). Then there's the usual - appointments, laundry, cleaning bathrooms, grocery shopping, blogging and freelance writing - to fit in. Plus, every spare moment my husband and I have been planting flowers (him planting, me pointing) and spray painting our outdoor furniture. (We let it all get shabby at once.) We are imagining that there might be a day or two when we actually get to sit outside and enjoy our yard. Ha. All this is to say, sometimes cooking falls by the wayside. On the weekend there was a pizza party - what else do you feed teenage boys at a birthday celebration? And then we took my son shoe shopping and to dinner (veggie burgers, fries and pop at Harvey's). I tried to ensure there were some healthy eats too - I gave the boys watermelon with their pizza and fruit and homemade banana muffins with their breakfast, for example. But nothing too strenuous to prepare. I feel pretty tired this week (inhaling all that spray paint perhaps? ), but I think my Monday day of eats looks fairly darn healthy anyway. 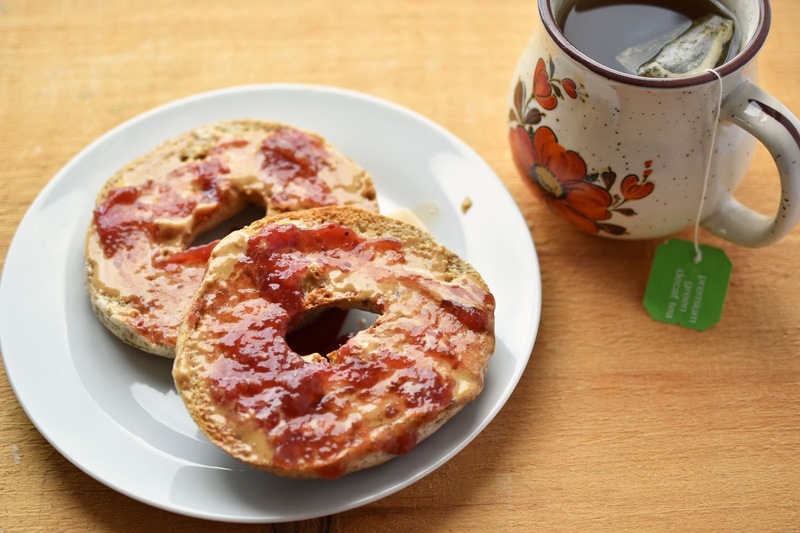 I wasn't very inspired in the morning, so I had a toasted whole wheat bagel with peanut butter and jam and a cup of decaf green tea. 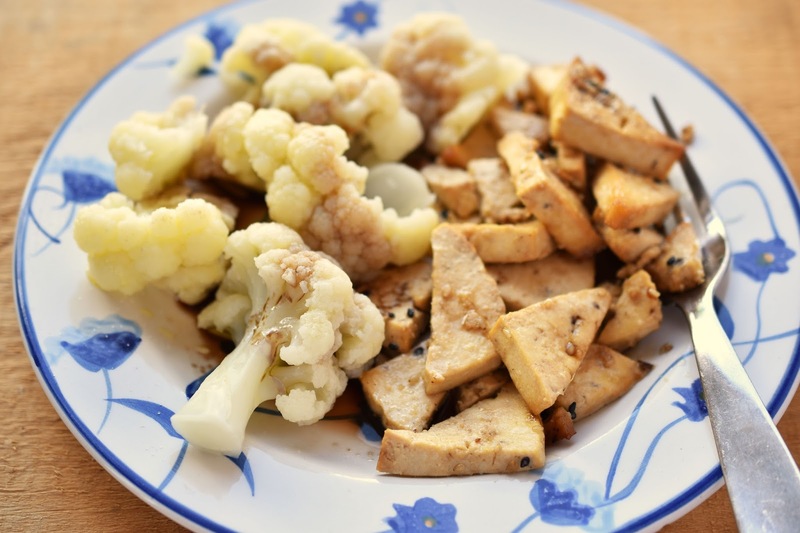 Lunch was dinner leftovers - extra-firm tofu triangles baked with tamari, garlic powder, sesame oil and sesame seeds. Plus steamed cauliflower topped with olive oil, salt and balsamic vinegar. 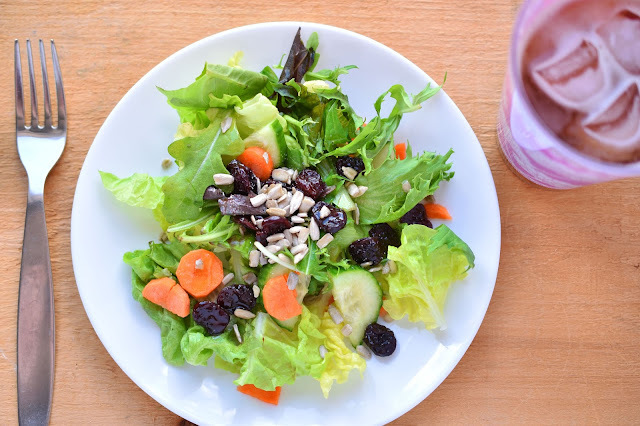 For lunch I also had a mixed greens salad topped with carrots, cucumber slices, dried cherries and sunflower seeds. I washed it down with an iced tea (sweet tea). 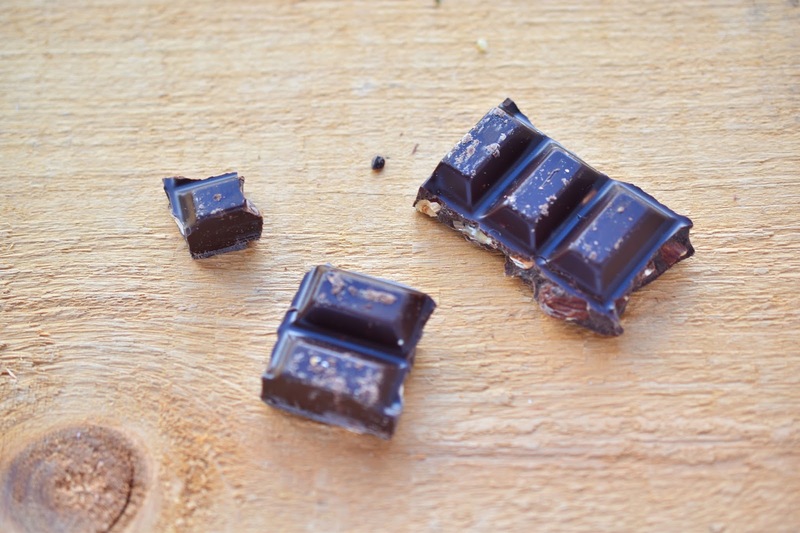 I munched on my favourite President's Choice dairy-free dark chocolate with almonds for a mid-afternoon treat. 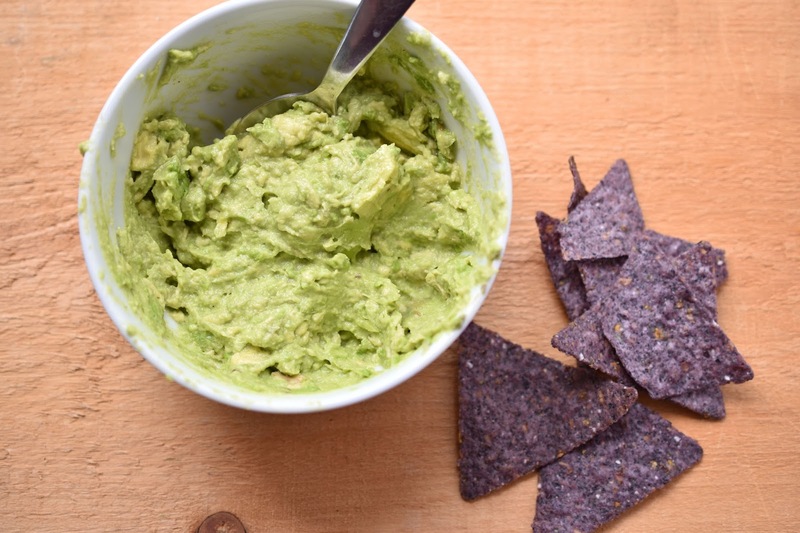 In the late afternoon, my husband made fresh guacamole to hold us over until dinner. We ate it with Que Pasa organic blue corn tortilla chips. I found the guacamole so filling that I didn't feel like eating dinner. I decided to have a salad (and believe me, I'm not normally a salad-for-dinner kind of gal). But then I kept adding more toppings to the salad so it became a decent dinner anyway. 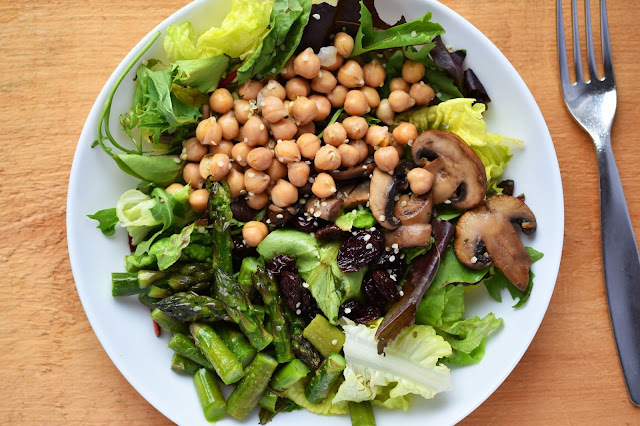 I roasted fresh Ontario asparagus with garlic powder and olive oil, chopped it up and put that atop my salad. I also topped it with chickpeas, sauteed baby bella mushroom slices, dried cranberries and hemp hearts. I almost always make an Italian-style dressing by just drizzling on olive oil and balsamic vinegar and sprinkling on salt. What my mother-in-law always does. It never fails. For dessert later that night, I made a nice cream from frozen strawberries, frozen banana slices and a bit of maple syrup. So, despite my lack of desire for cooking this week, I managed to get in a good quantity of vegetables and fruits...on that day anyway. What easy, healthy meals do you rely on when you're busy? 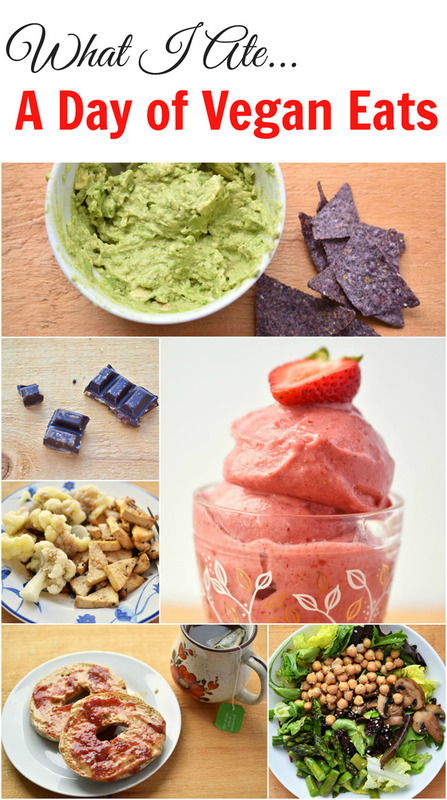 Please give me your (vegan) meal and snack ideas by leaving a comment below! Linking up to What I Ate Wednesday by Peas and Crayons, this week hosted at The Big Man's World. 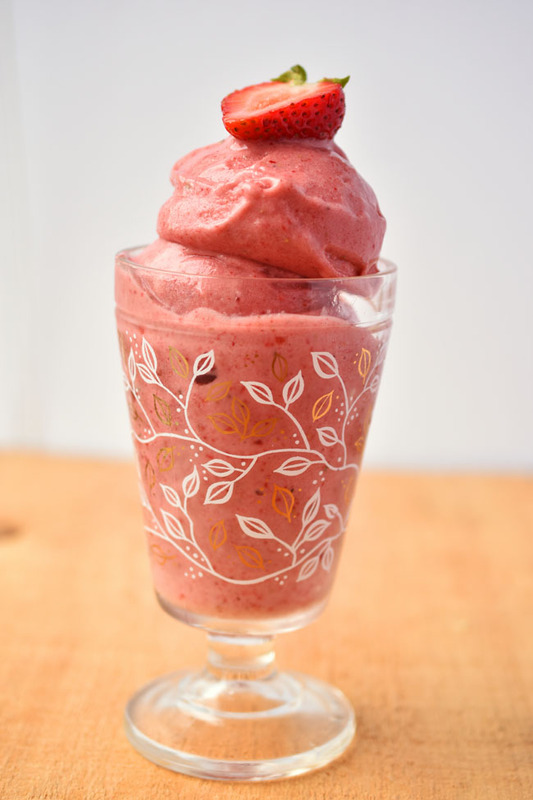 Your nice cream looks so pretty! mine always looks like a (delicious) blob ha!